A clinical trial is not born overnight. The success of a trial can quite often hinge upon the initial research that is done beforehand. Before you can embark on the process of recruiting patients to a clinical trial, data must be collected to provide background and insight. Decades of research show that successful clinical trials begin with an organized recruitment and retention plan. Planning for patient recruitment starts with digging deep and answering important questions about your trial and the patients who will be crucial to its success. Customize your unique outreach strategy by getting in the minds of your potential patients’ (their knowledge and awareness of disease and clinical trials), as well as potential barriers and stumbling blocks in trial participation. In-depth research should be conducted to ensure that any logistical, motivational, and behavioral barriers to participation for patients, caregivers, and providers are understood and planned for. What is the target patient population for this study? What is the prevalence of the condition in the country in which I’m recruiting? What are some of the main patient organizations associated with the condition? What are the most common questions and concerns patients have about the condition? Where is the patient population likely to get information/education? Are patients likely to engage online and through social media? If so, what channels do patients most frequent? With cancer patients, for example, only a small percentage have ever participated in a clinical trial. This is likely due to a variety of issues including lack of awareness that a) clinical trials are a treatment option or b) what a clinical trial even is. Outreach initiatives can be used to inform referring physicians and potential participants about available trials. Moreover, outreach efforts can be used to inform potential participants about the general role of clinical trials in health and medicine. Several potential explanations could be offered in answer to the mystery of low patient participation in a clinical trial. Reasons could include lack of patient and provider awareness of clinical trials that may be of interest (as just noted), recruitment and communication methods that are out-of-date, and pre-conceived negative ideas about clinical trials. According to a survey conducted by the National Cancer Institute in regard to clinical trials, 37% of patients believed that standard treatment was the better option and 22% feared that they would be treated like a guinea pig. This is why doing ground-level research before constructing a recruitment action plan is so important. Getting ahead of and addressing any misconceptions, fears or doubts a potential participant may have will help to bolster your enrollment. 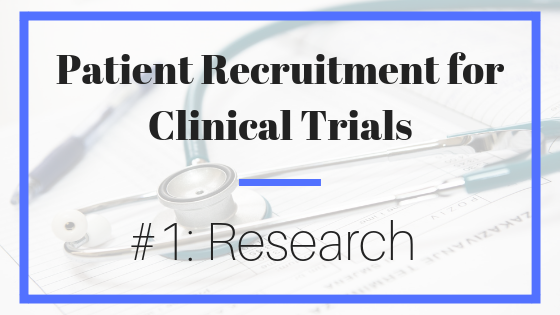 Want more Patient Recruitment for Clinical Trials? Come back again next week for the second installment!